Heeling House founder, Kathy Benner, has always had a love for animals: she rode horses competitively and is qualified in Exotic Animals and Training Management. 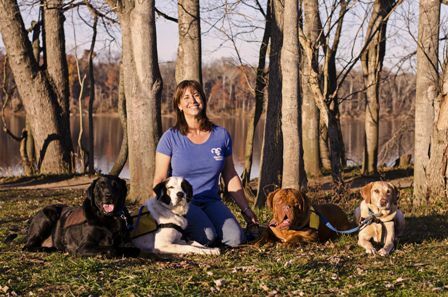 Now, Benner is using her training with animals to improve the lives of children with disabilities in our area. She “felt that [she] had a responsibility to make a change in people’s lives” and is helping children with special needs by running Heeling House. Heeling House opened its doors in September 2014 and provides Animal Assisted Therapy “AAT”, Animal Assisted Education “AAE”, and Animal Assisted Activity “AAA”. Right now, most of the therapy sessions are AAT, which means health care professionals, along with the animals, are used to help children meet specific goals, like standing on their own and going up and down stairs. For these therapy sessions, Benner visits patients at the Children’s Therapy Center in Springfield and Sterling, Virginia. Benner occasionally works with Loudoun County Public Schools by visiting children in Individualized Education Programs. The children have a wide range of disabilities and ailments like autism, cerebral palsy, sports injuries, Spina Bifida, brain injuries, and many more. The sessions are usually 50-minutes long, and the children they serve range in age from three to nineteen. All the dogs have therapy dog certifications through Pet Partners, so are adept at taking commands, polite, playful and smart. Atlas, for example, is a lovable physical therapy dog. He stands next to children so they can brace on him, and helps them transition from place to place. Another one of the dogs, Juan, is especially good at understanding the children’s personalities, and will actually play board games with them. Benner sees significant improvements in the children’s physical, social and mental health by working with the dogs. They are much more sociable, able to stand on their own, have developed good communication skills, and are learning good behavior. Some of these improvements are dramatic, like a child who wasn’t walking at all being able to take her very first steps with the dogs. Benner notes that “not a dry eye was in the room” when the child was learning how to walk. Since Heeling House is a non-profit, they are in need of donations from those who believe in their mission. They have fundraising events throughout the year, but we can easily give to their cause on their website at http://www.heelinghouse.org/ and can contact them by calling 571-409-1228.